Any tips on what you do for a bike lock for a solo on road / off road long distance tour? I’m thinking mini Kryptonite U lock, plus 4 foot of cable. But it has a high weight penalty (just over 1.5 kg total I think). I initially thought of just a combination cable but there’s bound to be times when I need to leave it somewhere for a while in built up areas. Particularly on my own, I’m thinking it’s possibly a necessary evil. Any thoughts? Nick. Compared to some people I’ve met, I’m pretty minimal when it comes to locking my bike on tour. Generally, I’ll just carry a standard Kryptonite cable and separate padlock, which doubles for securing doors of cheap guesthouses, many of which use shonky padlocks. It wouldn’t do much to slow down a professional thief, but it’s something. The bike always comes with me into a motel or guesthouse, and I never leave my bike locked in a city where I can’t keep an eye on it. For the times when I have spent longer periods in US cities, I’ve managed to borrow something more secure. 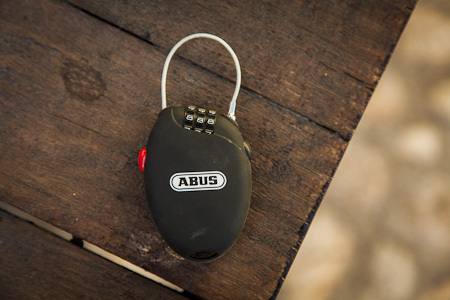 Abus wire lock: it won’t delay a professional thief for more than a moment, but will at least immobilise a bike from the opportunist. 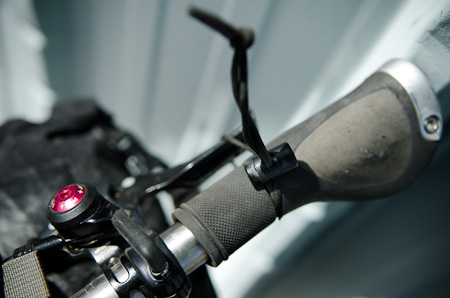 A bicycle handbrake is useful for securing your bike when packing up, and is another method to slow down a potential thief for a few valuable seconds. This entry was posted in Q&A on March 20, 2013 by Cass Gilbert.